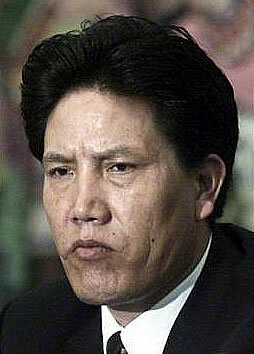 China’s regime announced today the appointment of Mr. Losang Gyaltsen aged fifty five, as it’s latest colonialist governor tasked with heading ongoing oppression of Tibetans, in the so-called Tibet Autonomous (sic) Region. Which western media wrongly describe as ‘Tibet’, in truth it comprises around a third only of historic, geographical and cultural Tibet. His promotion and job description is straight out of the collaborator’s handbook and like Norway’s infamous traitor, Vidkun Quisling who loyally served Nazi Germany this Tibetan deserves the condemnation and contempt of all who value human rights, justice and national freedom. This week has seen a number of Chinese government websites disabled by Anonymous in an ongoing exercise in what is a clear example of ethical hacking.Operation Tibet has struck again today with news that a site representing China’s regime in the occupied region of Amdo has been crashed once again. 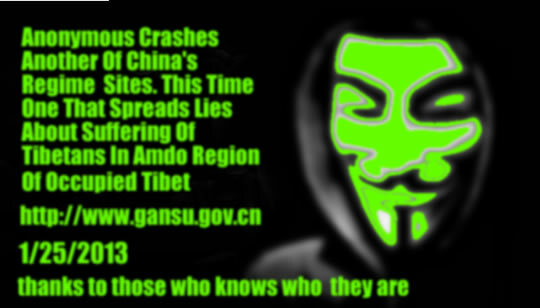 The site http://www.gansu.gov.cn was at the time this post was published, not loading, a matter of celebration for Tibetans, whose own official sites have come under relentless cyber attack from China’s state approved hackers. Our thanks to @tibettruth for alerting us on this. Breaking reports, now confirmed, that a young Tibetan man, named as Tsebhe, has today self-immolated in Amchok, Amdo region of Eastern Tibet, to protest against China’s illegal and brutal occupation of Tibet. Reports breaking from Golok region of Amdo in Eastern Tibet that a 29 year-old Tibetan named as Lobsang Gedun has today self immolated in protest against China’s illegal and violent occupation of Tibet. The eastern Tibetan regions of Amdo and Kham have during the past few days seen a series of self-immolation protests against China’s illegal and violent occupation of Tibet.Today Mr. Kalsang Kyab sacrificed his life on the doorsteps of a local Chinese regime office in Ngaba, Amdo Region.